Ann Bell taught medical technologists, medical students, residents and physicians at the University of Tennessee College of Medicine where she worked for 55 years. 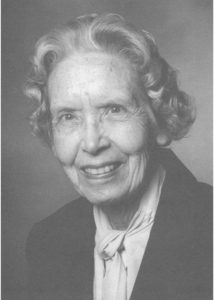 But Ann Bell is not a physician and she is not a Ph.D.
She was a professor of clinical laboratory science and began her career as the secretary to the Department of Clinical Pathology in 1941. And her students awarded her a “Golden Apple” – an award usually reserved for M.D.s only. Ann is a nationally recognized leader in the study of hematology and oncology who has presented more than 130 national workshops and given papers all over the world. Ann came to her UT job with a degree from Randolph-Macon Woman’s College. The following year, she began five years of training in clinical pathology with Dr. L.W. Diggs, the late professor of medicine at UT and an expert on sickle cell and other blood diseases. In 1954, with Diggs and Memphis artist Dorothy Sturm, Ann published The Morphology of Human Blood Cells, which is now in its fifth edition as the definitive textbook on hematology. She developed a national technologists’ training program and manual that is used throughout the world. In 1969, Ann became licensed as a medical laboratory supervisor in hematology by the Tennessee Department of Public Health. She was the ninth person certified as a specialist in hematology by the American Society of Clinical Pathologists, and in 1981 was certified as a clinical laboratory specialist in hematology by the National Certification Agency. While continuing her multiple duties at UT, Ann attended Memphis State University from 1970 to 1974 to obtain required courses to enter graduate school, and she completed a Master of Science degree in cell biology in 1977. She has published numerous original and indexed scientific articles and assisted with many others. The Pathology Society in 1988 named her “Technologist of the Year,” the highest national award for individuals in the field. “Ma Bell” officially retired five years ago – but not until March 1996, at the age 75, did she stop. She continued “part-time” as emeritus assistant professor of clinical laboratory sciences in the College of Allied Health Sciences.